Roofing Frequently Asked Questions | DA Roofing | Roofing Contractor Servicing Auburn, Carmichael, Citrus Heights, El Dorado Hills, Folsom, Granite Bay, Loomis, Placerville, Rancho Cordova, Rocklin, Roseville, Sacramento, Shingle Springs and the surrounding area. Whether we are repairing your roof or re-roofing your home, DA Roofing wants you to be completely knowledgeable of the roofing services we are providing. This page has been designed to answer many of the questions you may have. If you have any further questions or would like to schedule a consultation with one of our specialists, please feel free to contact DA Roofing at 916-715-1032. How long can I expect a roof to last? Is there anything I can do to prolong the life of my roof? How do I know when to repair or replace my roof? What is a tear-off? Do I have to replace my entire roof if it leaks? Can I do roofing work myself? How much does a new roof system cost? Can a new roof be installed on top of my old roof? What type of roofing materials should I choose? How long does a re-roofing project take? How long will my solar system last? How does a solar system work? How does "going solar" save me money? How much can I potentially save by going solar? How long can I expect a roof to last? The average life of an asphalt-shingled roof is 25 to 35 years. By trusting a roofing professional such as DA Roofing it is possible to extend warranties by up to 35 years. Is there anything I can do to prolong the life of my roof? It is important to keep gutters free of debris and to clean leaves and other materials from around chimney flashing, vents, and valleys. Keep the roof clear of anything that might work its way under shingles or flashing and cause them to loosen. In addition, be sure to keep trees trimmed away from flashing. How do I know when to repair or replace my roof? The first thing you need to know is the composition and age of your roof. 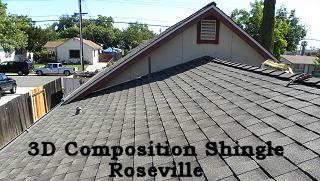 If it is a standard shingle that is almost 20 years old it is probably time for a new roof. If the age of the roof is unknown inspect the shingles for loss of granules, fracturing, or curling of roof material. A leak is an obvious indicator that something needs to be fixed. Leaks are not always obvious, nor are they necessarily located directly under the section where the ceiling is dripping. Water seeping in from the roof often travels along rafters and studs to a low point. This causes discolored spots on the ceiling and walls. Sometimes even a musty smell may indicate a roof leak. Before making a decision about your roof, have it inspected by DA Roofing. We will identify any problems, thoroughly explain your options, and provide costs before the job begins. The materials installed on your roof are heavy. Too many roof layers applied over one another can become so weighty that they may be hazardous. If the roof is too heavy, it can become damaged and collapse. There are code requirements from city to city that specify the number of roofing layers that can be applied consecutively before it is necessary to remove all the old roofing materials before installing a new roof. A tear-off increases the cost of your new roof, but it will not create issues when done correctly. However, it is important to hire a capable company such as DA Roofing since a sloppy tear-off can damage both your house and yard. Do I have to replace my entire roof if it leaks? It depends. If the leak is simply caused by a small section of roof that has been damaged, then you will need to repair the source of the leak. However, if the entire roof has failed then a new roof installation necessary. Can I do roofing work myself? Roofing work is generally not a "do it yourself" project. Professional roofing contractors such as DA Roofing are trained e to safely and effectively repair or replace your roof. An untrained homeowner can actually harm a roof with improper roofing techniques. Simple maintenance tasks like inspecting a roof during the spring to look for broken or crack shingles and cleaning out gutters filled with debris are suitable for most homeowners. Most roofing projects end in additional costs and headaches for the homeowner, so they are best left to trained and experienced professionals. How much does a new roof system cost? The cost of a new roof can vary greatly and will depend on factors such as materials, location, time of year, size of the home or building, average labor rates, and whether the project is residential or commercial. Can a new roof be installed on top of my old roof? Although it may seem beneficial to install new shingles on top of your old roof because it is cheaper or faster, you could be setting yourself up for future costs. At DA Roofing, we suggest to strip the old materials complete off and then add new materials. Any potential problems in the plywood deck will go unnoticed unless you de-nail and re-nail. Homeowners can choose from composite or asphalt shingles, metal roofing, cement, clay or slate tiles. At DA Roofing, we are dedicated to using only the best quality roofing materials to complete any roof repair, new home roof installation, or roof replacement service. How long does a re-roofing project take? The amount of time it will take to complete your re-roofing project will depend on the size and complexity of your roof, the weather and season, if your old roof needs removed, and unforeseen issues with the roofing system. A small, uncomplicated roof may only take a few days to complete. However, a large, complicated roof may take several weeks to finish. If you would like a better estimate regarding your particular roof, give our roofing experts at DA Roofing a call. Solar system panels have fairly simple technology because they have no moving parts and as long as they are kept clean they can last for at least 20 years. Most last for up to 40 years. 1. Solar panels are designed to convert sunlight into direct current (DC) power. 2. This DC power is sent through an inverter and converted into standard electrical current that is used in your home, or alternating current (AC). 3. The AC power is fed through the breaker box, thus providing power to your home. 4. The utility meter, which measures electrical usage, will measure any over-production from your solar system and credit for the output current. This is called net-metering. 5. Even though your home is powered by solar energy, the utility grid will remain connected to the home so in rare occasion that your panels are not producing enough to power your home;ie at night. How does "going solar" save me money? Solar isn't just environmentally-friendly but it is also cost effective. By purchasing a solar system outright you can virtually eliminate your electric bill, saving you the equivalent of your monthly electric bill. Going Solar also increases your property value, providing an attractive incentive to a would-be buyer should be decide to sell. How much can I potentially save by going solar? The best part about "going solar" is that you will no longer have to deal with increasing electric rates. Typically, utility companies increase their rates about 5% each year. "Going solar" means that you avoid those rising costs. We hope this page has been informational. If you have any further questions, please contact DA Roofing at 916-715-1032.